Unfortunately death does not always happen to people who are active in their daily lives. Most individuals would be missed by friends and family members if they don’t return a phone call or show up on social media sites like Facebook and Twitter. Unattended deaths, most of the time, will happen to an older person who is retired and mainly keeps to themselves. I think I may have one or two in my neighborhood. In most cases, unattended deaths can can go unnoticed for long periods of time before it is discovered by someone that’s usually close to that individual. Sometimes the Postal carrier will notice an odor or flies around the windows that are pretty large. 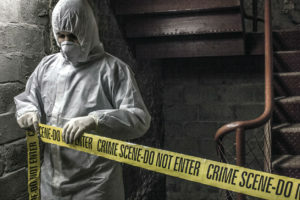 When a deceased individual is discovered, The police and investigators are called out to do their investigation to make sure the deceased wasn’t murdered. After the investigation it’s time for the cleanup process to begin. Human decomposition is a very foul odor and extremely hard to get rid of in homes and commercial properties in Baton Rouge. With the high heat temperatures in Louisiana along with the humidity, human decomposition will sit in much faster that places like NY where temperatures are much cooler.